Middle childhood provides the foundation for a full, happy and healthy life. Middle years children are learning how to keep themselves healthy and are starting to take on responsibility for their own eating, sleeping, exercise, dental care and personal hygiene based on their abilities. Health and wellness looks different for all children, and our goal is for optimum health and wellness for all children. Supporting children in the middle years to optimize their health means supporting them to be active and well according to their own abilities, establish healthy behaviours, connect with the land, and have a strong sense of self and spirit. These lay the foundations for a healthy and happy life. While we know many children in Ontario are healthy and well, there are also troubling signs. For many Ontario children, challenges with being overweight and/or obese are undermining their health and this puts them at risk for obesity and associated chronic diseases in adulthood.37 The problem is more severe in boys than girls.38 Sedentary behaviours, excessive “screen time,” lack of unstructured outdoor play, sugary/unhealthy food choices, limited knowledge/participation in food preparation, and food insecurity are contributing factors. These factors also affect other aspects of children’s health and development beyond their physical health. Some children are living in homes where parents struggle with mental health and addictions issues, and/or experience domestic violence, or face other forms of toxic stress. Toxic stress has far-reaching impact on children’s cognitive, social and emotional development. Health outcomes for children and families can be associated with a number of social and environmental factors and barriers. The conditions in which we live explain in part why some Ontario children and families are healthier than others and why some are not as healthy as they could be. Race and ethnicity are shown to be factors associated with differing levels of health status, access to health care, experience with health care, and disparities in health outcomes for new immigrants, racialized communities and Indigenous peoples. Language is a barrier for many newcomer families accessing health services. Poverty, food insecurity, unstable housing and homelessness, isolation, and discrimination are other risk factors to good health and access to the resources and supports available in our neighbourhoods, schools, and communities. When children grow up eating well and being physically active, they are better prepared to learn and develop. Middle years children are learning how to keep themselves healthy, and they are establishing attitudes about their physical health that are long-lasting. However, many children in this age group are still not getting what is needed for their optimal physical development – which impacts their development into adulthood. Research tells us that getting enough quality sleep is essential for physical development and wellbeing. The ability to pay attention, think critically, and be happy are linked to getting sufficient sleep. Likewise, eating healthy, nutritious food contributes to wellbeing and stimulates brain development and physical growth. Ontario children who do not eat a healthy, balanced diet are more vulnerable to obesity and illness, including Type 2 diabetes in adulthood.45 We need to ensure that all children in Ontario have access to healthy nutritious food, every day. Middle years children need to move and play in ways that are fun and rewarding. For some children, participation in physical activity can be challenging due to barriers like cost, transportation and the availability of accessible, safe and inclusive programs. We also know that girls drop out of physical activities at a faster rate and earlier than boys.46 We need to ensure that all children are included in physical activity programming. We need to give children the opportunity to build their physical competencies and to participate in ways that build their sense of accomplishment and enjoyment. When we create affordable, accessible, inclusive sports and recreation opportunities, and get children involved in active, unstructured free play, everyone in the community benefits. The Province has responded with a number of initiatives through the Healthy Kids Strategy, such as the Healthy Kids Community Challenge, and the Healthy Eating Active Living Program in Indigenous communities. The Student Nutrition Program and the Northern Fruit and Vegetable Program together also provide healthy food to nearly a million children each year. Regular, high quality, family-centred health care is essential for healthy child development. For the most part, middle years children in Ontario are connected to primary health care services, although we know that children living in remote areas or low-income neighbourhoods face additional barriers and are less likely to have a primary health care provider. Improving access to primary care for families, along with additional specialized services when they are needed, is crucial to support all children in Ontario to be healthy and meet their developmental milestones. Starting in 2018, Ontario is making prescription medications free for everyone with OHIP coverage 24 years of age and younger, regardless of family income. The Children and Youth Pharmacare Program will provide free prescription medications for more than four million children and young people, helping families who may not have access to comprehensive drug benefit plans. The importance of oral health to overall health is well supported by evidence. Untreated tooth decay and gum disease can negatively impact oral and physical health, and affect children’s ability to learn. Not all families have access to dental insurance or can afford to pay for dental care. Supporting children from low-income families to improve access to dental care is a priority of Ontario’s Poverty Reduction Strategy. Healthy Smiles Ontario is an integrated dental program for children and youth from low-income families to improve access to care. To date, more than 365,000 children and youth from low-income families have been enrolled and have accessed dental care. The Focus on Youth program provides $8 million in funding to 23 school boards to support summer programs for children and in communities of high needs (as determined by population, median family income and crime rate data). Through providing employment opportunities for youth, and summer recreation opportunities for children, both children and youth are supported to thrive. Through Open Minds Healthy Minds, Ontario’s Mental Health and Addictions Strategy, and the Moving on Mental Health action plan, the Ontario Government is improving access to high quality mental health and addictions services, strengthening worker capacity, creating a responsive and integrated system and building awareness about mental health issues within communities. Many Ontarians have culturally embedded concepts of mental wellness as connected to a sense of self/spirit, family, community, culture and ancestry. For example, Indigenous ways of knowing understand health and wellbeing as a lifelong journey where wellness and spirituality are inseparable and include being connected to the land, nurturing the spirit, participating in culture and having healthy relationships.50 By understanding and providing mental health services in culturally responsive, relevant, and safe ways, service providers and allies can honour the traditions and knowledge of all families in Ontario and provide interventions that are strengths-based, wholistic, and support the overall wellbeing of the child and family. Having optimal mental health involves being supported to adapt to change, find balance and resilience, having a sense of purpose and satisfaction with life, and being able to understand and regulate feelings and behaviour. We know that childhood mental health difficulties, such as depression, are linked to factors like poverty, homelessness, toxic stress and family challenges.51 Supporting children to understand and express their feelings helps them to deal with adversity and challenge. Children also need to know where to go, and who they can talk to if they need help dealing with a challenging or negative experience. Teaching skills such as help seeking, stress management and mindfulness, self-regulation, empathy for others, and self-care, and helping children build positive relationships, connect with culture, and be active can support resilience and wellbeing. Feeling good about yourself leads to improved self-care. Poor body image leads to the opposite, and we know that “body-bullying” is one of the most frequent forms of bullying. Stop Now and Plan (SNAP) is an evidence-based family-focused intervention program for high-risk 6-12 year olds. It teaches children self-control, problem-solving and emotion-regulation skills, and runs concurrently with a parents group that teaches child management strategies. Through the 2017 Ontario Black Youth Action Plan, SNAP has been expanded to specifically target high-risk Black middle years children and their families. Mental health challenges can “get under the skin” of children in their daily lives, leading to isolation and/or disengagement.52 Talking about mental health, disability, mental health challenges and mental illness openly and honestly, and promoting awareness and empathy among children, helps to reduce stigma and can ensure that more Ontario children and their families are seeking help and getting support when they need it. In 2016–17, the Ministry of Children and Youth Services committed $4.5 million to First Nations and urban Indigenous partners to build capacity and to lay the ground work for ongoing life promotion investments. Healthy habits formed early in life act as protective factors and help ensure that children in the middle years have the foundation they need to have a happy, healthy and well-balanced life. Children in this age range are learning and practising ways to take care of their own health, safety and wellbeing. It is also a time when children can continue learning about their bodies and deepen their sense of body image, confidence, self-awareness, and self-efficacy (their belief in their ability to succeed at something). Part of healthy habits and wellbeing is being able to connect with the land and get outside in the natural world. It is important that children not only gain connections with the natural world as part of their wellbeing, but are also learning about their responsibility to the land and their role as environmental stewards. We know that many habits and skills, including eating, physical activity, healthy relationships, being safe from violence, and technology use, and awareness of risks such as sedentary behaviour, are learned through watching role models at home, at school and in the community. When families and other adults are able to model healthy habits and behaviours, children are more likely to be healthy. Some examples are preparing nutritious meals, eating together as a family, and getting outdoors. Under the Healthy Kids Strategy, the Province passed the Healthy Menu Choices Act, 2015, requiring food service premises with 20 or more locations in Ontario to post calories on menus, making it easier for families to make informed and healthier food choices when dining out. Learning to be active in ways that are fun, responsible and relevant to their abilities, cultures and backgrounds can support children to build healthy habits that will last a lifetime. Children who connect to outdoor activities have lower risks of being overweight and depressed, do better in school, have better social skills, feel less isolated and have better self-control and stress management.53 It is also important to support environmental stewardship (such as recycling, not littering, not wasting water) and build children’s connection to nature. Opportunities for adventurous, unstructured outdoor play and land-based activities can help children get outside, be active and learn how to assess and take managed risks. We need to create opportunities for children to engage in safe and independent exploration of our communities and natural world. This is particularly important for First Nations, Métis and Inuit children and families, as connecting to the land and environmental stewardship is a key part of cultural learning. The Ontario Sport and Recreation Communities Fund (OSRCF) is a grant program designed to provide funding to organizations for the successful delivery of sport, recreation and physical activity projects. The key goals of the program are to support initiatives which: increase opportunities for participation in PHYSICAL ACTIVITY; embed PHYSICAL LITERACY throughout sport and recreation; and increase the CAPACITY of the sport and recreation sector to deliver quality programming. The program is targeted at populations that lack equitable access to participate and/or have been historically less physically active. Technology provides children with an ability to interact with the world around them and an opportunity to participate as digital citizens. Learning healthy, safe and responsible online habits requires guidance from parents and caregivers. This could mean talking to children on a regular basis about their online lives, how to identify and address cyberbullying, modelling responsible and healthy practices, and establishing rules and healthy boundaries around technology use.54 Evidence shows that for many middle years children in Ontario, excessive use of technology can hinder development and increase vulnerability to social and emotional stressors. This is due to both direct impacts (for example on brain development) as well as lost opportunities, such as physical activity and prosocial interactions. However, research also shows that strict monitoring and surveillance of online behaviour may not be as effective as promoting responsible independent behaviour.55 Children can be supported to use technology appropriately and responsibly, including building in short and longer breaks from screen time. The goal of the Healthy Kids Community Challenge (HKCC), a key part of the Healthy Kids Strategy, is to support the wellbeing of Ontario’s children and to help create communities where it’s easy for children to lead healthier lives. 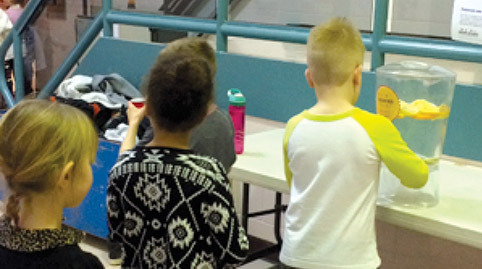 Forty-five communities across Ontario are participating in the Healthy Kids Community Challenge. The government provides them with resources including funding, training and social marketing tools to help promote healthy eating, physical activity, and healthy behaviours for children. Run. Jump. Play. Every Day. was the first theme launched in September 2015, and encourages physical activity through a mix of active play, active transportation, sports and structured physical activity. Theme two, Water Does Wonders, encourages kids and families to reach for water when thirsty instead of sugar-sweetened beverages. Theme three, Choose to Boost Veggies and Fruit, encourages kids and families to eat healthier and to make vegetables and fruit part of their everyday lives. Photo: Agencies in London have opted to stop offering juice to kids, and instead only offer water. At special celebrations, fruit, veggies and herbs are added to “boost” the flavour without added sugar! 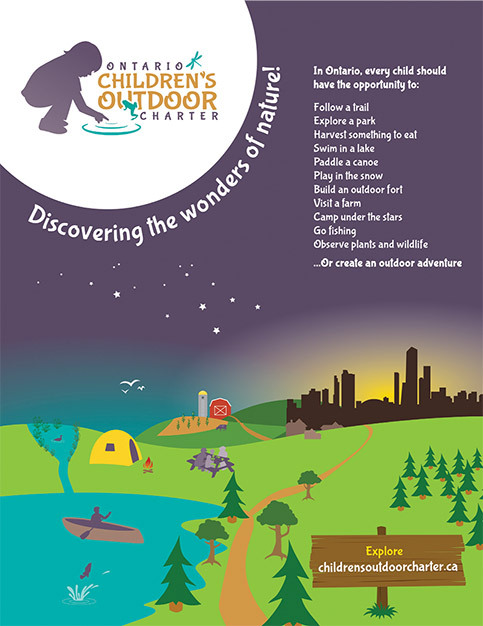 Children have the right to explore and play in the outdoors. Research shows that kids who spend regular time in nature are happier and healthier.